Spaghetti squash is an oval shaped yellow or striped member of the pumpkin and squash family. The flesh has a lightly sweet nutty flavor and falls apart into noodle-like strands when cooked. This makes it a great lower carb alternative for noodles in various recipes. My favorite way to eat it is with a creamy sauce and some crispy tempeh bacon or smoked tofu. The vegan cheese sauce in this recipe uses a tiny bit of flour to help it bind. This adds about 3 grams of carbs to the total of about 25 grams of net carbs per serving, making this more of a medium carb recipe. If you want, you can leave the flour out or substitute with a lower carb alternative. The texture will turn out a little different, but it will still be good. It takes a little time to roast the squash, but otherwise, this is quite a quick and easy recipe. If you like doing meal prep, you can prepare the squash and sauce in advance. They will keep for about four days in the fridge. One squash usually makes about four servings. Preheat the oven to 200 C / 400 F. Cut the squash into 1 inch rings and scrape out the seeds. Cover an oven rack or baking sheet with parchment paper, place the squash rings onto it and rub them with a little oil. Roast the squash for 50-60 minutes until soft, but not browned. Let the squash cool down a little until it is safe to handle. Scrape the flesh from the peel and shred it with a fork or your fingers to make 'spaghetti'. I usually don't manage to get very long thin strands, so just do the best you can. It will still taste good with shorter thicker pieces. In the mean time, make the cheese sauce. Sauté the onion in the oil until translucent. Add the flour, nutritional yeast, thyme, salt and milk. Stir well while you bring it to a boil. Turn down the heat and let the sauce simmer for another three minutes, so it can thicken en they onions cook a bit more. Fry the tofu or tempeh until browned and crispy. 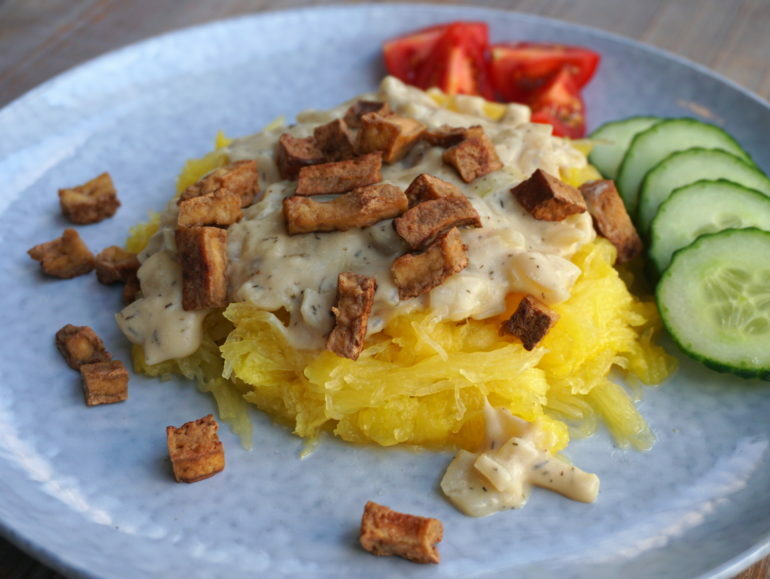 Divide the squash over four bowls or plates and serve with the sauce and the tempeh or tofu.